The pyramid is 6' by 6' at the base and about 5' high. The capstone is 6" by 6" at the base and about 8" tall. The frustum has the proportional dimensions of the great pyramid at Giza. 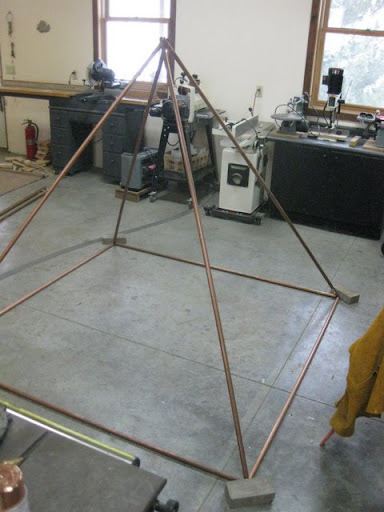 This project is was motivated by three sources who, somewhat independently, conspired to draw my attention to copper pyramids. My connection with pyramids in general began perhaps 20 years ago as I was thrust into an ongoing mystery relating to pyramids in Wisconsin and to the copper country of Upper Michigan. This lead to a brief period of study of pyramids and other earth artifacts such as dolmens and cairns--also found in Upper Michigan. At first, I thought the copper meditation pyramids where small, say about 16" square, that hung from the ceiling under one's medication cushion. 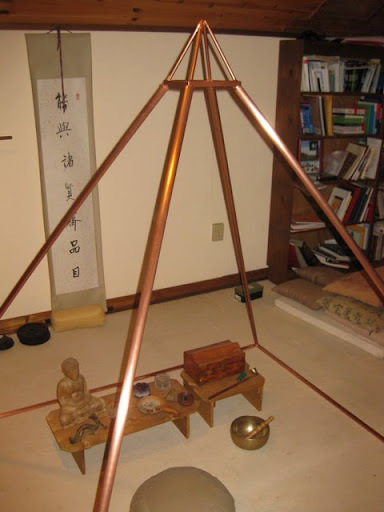 Then a friend sent a picture and I realized that the meditation pyramids were actually constructed of tubing and were large enough for a person to sit within. It just so happened that I had a supply of copper tubing in the garage that purchased for another "unfinished" plumbing project. I thought that I could put it to good use on a pyramid. I mean, how difficult could this be? I decided to use the geometry proportional to the great pyramid at Giza which is a five-sided pyramid with 90 degree corners, base sides of 755', a height of 481', and a slope angle of 52 degrees. The proportions demanded that the angle of 52 degrees be consistent. Herein is an issue. That means that the the overall geometry needs to be such that the meditator sit comfortably within the edges and have adequate head clearance. Frankly, I had to consult a high school student to help me with the trigonometry. I settled on base of 6' feet square which yielded a height of about 57". Since a separate capstone of about 8" was going to be constructed, the head clearance was about 49". My meditation consultants reported of my colleagues reported meditation heights (on cushion) of 33", 40", and 42". I think these are just about perfect dimensions for sitting meditation. The next step in the project was to construct the unions that would hold the base pieces together. 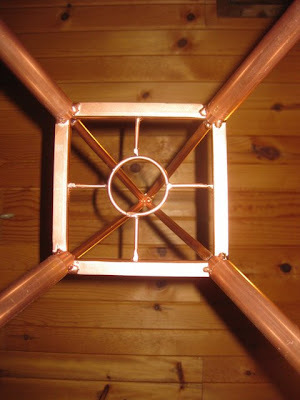 My first attempt was to try to weld a 52 degree receiving tube onto 90 degree copper fittings. I used a TIG machine with deoxidized copper rod. It was ugly and burn-through was a problem. My second attempt was to use oxy-acetylene. It was also ugly. 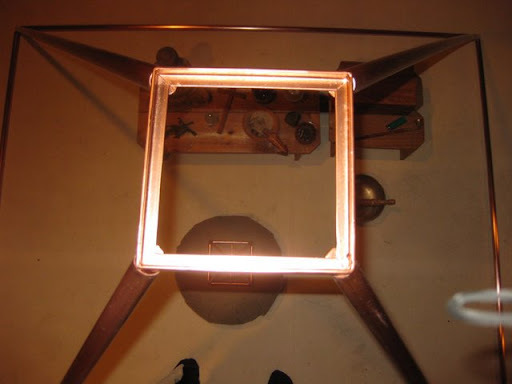 Copper melts in a fairly narrow range and if it gets too much heat, it tends to run. I abandoned the idea of using copper to construct the unions. I abandoned the copper and chopped 3/4" steel rod for the unions. 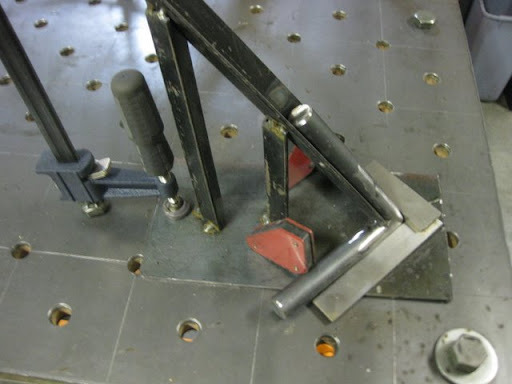 I next constructed a fixture that would hold the steel rod at 52 degrees to a base. Here is a picture of that fixture with squared off rods at the base and the angular piece on the angle iron. The 3/4" steel rod would provide enough substance to secure the base to the floor and the capstone to the top. The 3/4" mild steel rod fit perfectly inside the 3/4" copper tubing. I cut three 5" pieces of rod for each corner. 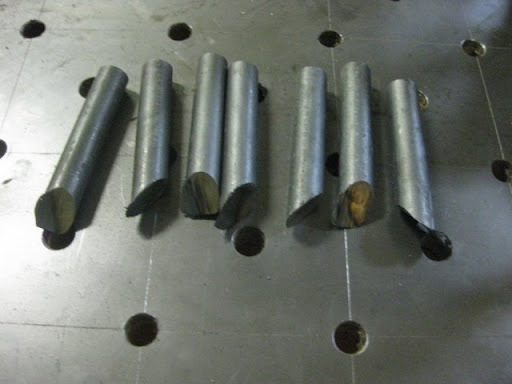 Two of the rods were cut at 45 degrees; the other at about 52 degrees. The latter cut did not need to be perfect as the fixture was at 52 degrees. 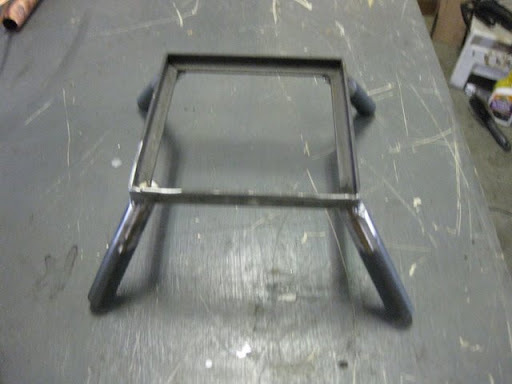 I then welded the two base pieces to from "L" shaped unions. 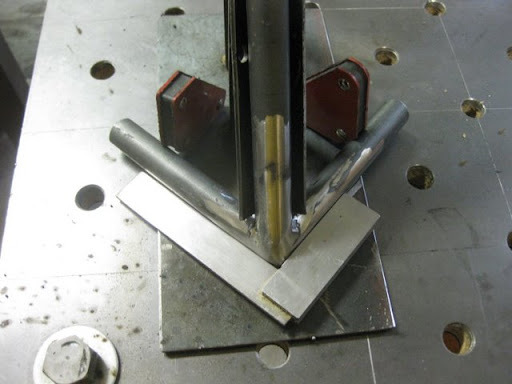 Then, this was placed under the 52 degree fixture and other rod was welded to the top of the "L." Here is a picture of the four corners placed against one another for testing fit. The next step was to construct the base for the capstone. Because the base was 6' square, I constructed the capstone base at 6" square. 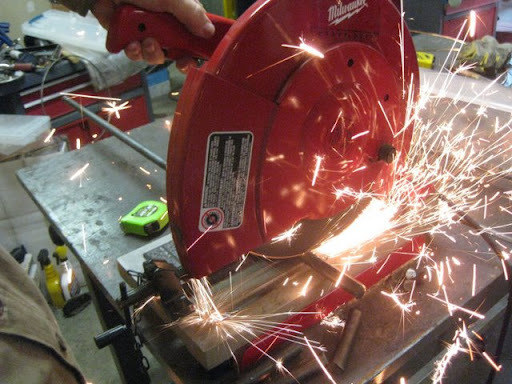 The base was constructed with 1/2" angle iron, cut at 45 degrees, and welded. 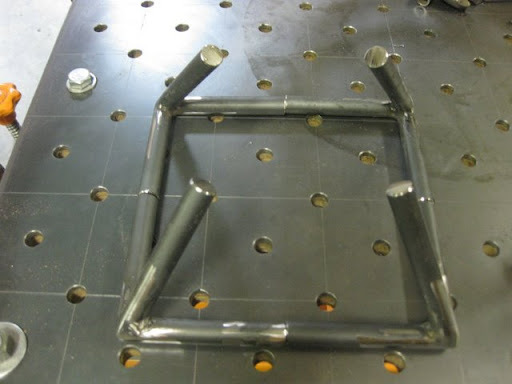 From this base, four 3/4" x 4" rods were welded to the outside to match the 52 degrees of the base unions. 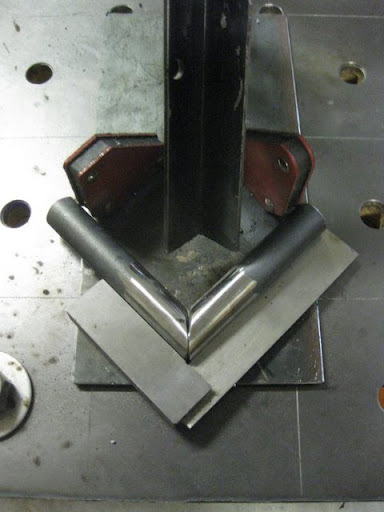 The last pre-finishing step was to test the fit of the angle tubes. Although I had the geometric lengths of the ascending sides, I elected to hand-fit the capstone base. The sides ended up to be about 6-1/2 feet long. The pyramid was then totally assembled for fit. Then each piece was disassembled and polished using 120, 220, 500, sandpaper, 000 steel wool and Brasso (where needed). The tubing then received a coating of Krylon gloss acrylic clear finish. Although the fit was not perfect, there was enough lateral tension to hold the pyramid together perfectly. I finished the capstone, painted the unions, and reassembled the pyramid in the dojo as shown in the following pictures. The following top-down picture shows the capstone base. 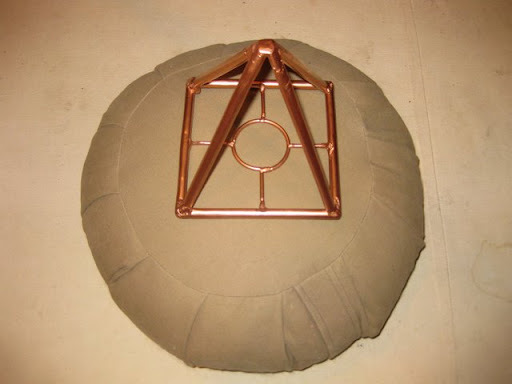 The following picture shows the capstone on a meditation pillow for scale. 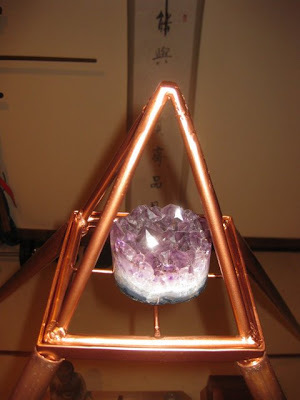 This picture shows the capstone on the pyramid with a quartz core crystal. 1. 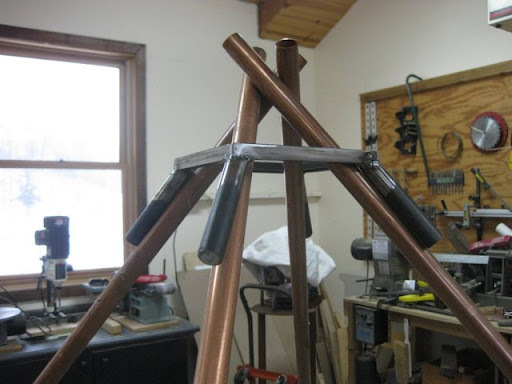 The most difficult part of the project was welding the copper. Copper has a relatively narrow melting point. I tried gas (oxy-acet) welding the copper with both deoxidized copper rod and #8 gauge electrical wire. The difficulty of this was the distribution of the heat. I finally relied on TIG welding the joints with both the deoxidized copper rod and #8 gauge electrical wire. I am not good with the TIG machine and needed to grind quite a bit. The difficult thing about grinding copper is that it gets mushy and you end up "pushing it around" a bit. I found that a pneumatic air grinder with a 3" carborundum wheel worked best with a careful hand. Frankly, the joints are not attractive....effective yes...but not attractive. The upshot of this is that it is my sense that good copper work done by artisans should be recognized as valuable. 2. Note that the capstone has steeper angles than the base. This was intentional to provide relief to the shape and to show that the capstone was a discrete object. I imagine that the stained glass capstone would be a beautiful addition. 3. When I have time, I will post the dimensions of the individual components and the geometric formulas should you wish to construct your own pyramid. 4. I will leave the mystical properties of pyramid form and the charging of the pyramid to other web sites where the subject is adequately covered.